Advocacy means to speak up, to plead the case of another, or to fight for a cause. Derived from the Latin word advocare, which means “coming to the aid of someone,” advocacy is an important function of most nonprofit organizations. It describes a wide range of expressions, actions and activities that seek to influence outcomes directly affecting the lives of the people served by the organization. At our core, we conduct public policy on behalf of the community partners we serve. Their partnership with Junior League of Los Angeles includes not only direct service project and programming, they also receive public policy efforts on behalf of their clients. Through our advocacy efforts, the Junior League of Los Angeles is committed to serving the needs of women and children in the Los Angeles area and throughout the state of California. Like many non-profits, the Junior League of Los Angeles conducts two primary types of advocacy: community and legislative. Community advocacy involves changing the ideas and attitudes of the public. This is typically accomplished through education programs that may include direct mail, publications, group presentations, and a Web site. Many nonprofits make effective use of the media to reach the public and promote an issue. Within JLLA, our community advocacy includes a variety of internal and external initiatives. Internally, examples include Public Policy Institute and our one day service events entitled Done in a Day with County Boards of Supervisors, Day at the Capitol and Day at City Hall and more. Collectively, these opportunities serve as a training ground for our members to learn about the role of advocacy and how to engage in public policy. Externally, our community advocacy efforts include Civic Leadership Forum, our nationally recognized “Speak Up When You’re Down” campaign, dissemination of thousands of domestic violence resource brochures, participation in coalitions and task forces, press releases and use of both traditional and social media to advocate on behalf of our community partners. Nonprofits pursue legislative advocacy when the target for change is a federal, state or local law, school board policy, or budget allocation. Nonprofit advocacy to influence legislation may involve legislative monitoring, committee testifying, lobbying, writing position statements or papers, organizing networks and coalitions, and a variety of other activities. The Junior League of Los Angeles is a proud sponsor of state legislation that creates opportunity and betters the lives of women and children. We conduct legislative advocacy through our State Public Affairs Committee as well as through our own sponsored and supported legislation. JLLA has a series of position statements in the areas of health, education, violence prevention and family support. Examples of successful JLLA led legislative advocacy efforts have included microbicides, childhood obesity, human trafficking, education, and public safety for children. JLLA has driven legislative initiatives for twenty-five years. We have a long history of impacting public policy and leading systemic changes through legislative advocacy. Most recently, in 2007-08, the Junior League of Los Angeles sponsored AB 2810 Assembly Member Julia Brownley (D- Santa Monica), which requires authorities to screen victims of domestic violence, child abuse or prostitution to determine whether the person may also be a victim of the serious and growing crime of human trafficking. It also provides specific privacy protections to victims. Source: Excerpts of descriptions of non-profit advocacy credited to “Learning to Give: Nonprofit Advocacy” by Joyce Johnson, the Center of Philanthropy at Indiana University. Several JLLA members have been elected by delegates of 17 member leagues of the State Public Affairs Committee to serve as Co-Chair: September Hill 2013-2014, Joy Burkhard 2010-2011, Julie Elginer 2009-2010, Grace Coopman 2008-2009 and Maureen Dowd 2004-2005. SPAC represents nearly 10,000 Junior League women throughout the state. Sustainer, Julie Elginer, joined sixteen women throughout four countries as a leading member of AJLI’s Collaborative League Engagement Taskforce. This highly selective, two-year commitment is evaluating opportunities for any of AJLI’s 292 member Leagues to collectively engage in advocacy. Actives, September Hill and Tasha Koumaris, adapted the “Speak Up When You’re Down” slogan to accompany Perinatal Depression Awareness month. They created nationally recognized posters, logo, resource cards and ribbons which have been disseminated throughout the state. Sustainer, Joy Burkhard founded and serves as the Executive Director and Board Chair of 2020 Mom. Its mission is to bring stakeholders together to exchange ideas, identify barriers and opportunities and form collaborative relationships to increase and improve maternal mental health awareness, diagnosis and treatment in California and beyond. Sustainer, Susan Steinhauser, serves as President of the Los Angeles County Law Library Board of Trustees and received her appointment from County Supervisor Zev Yaroslavsky. She also was appointed by the Governor to Vice Chair of the California Arts Council. Sustainer, Billie Greer, was appointed by Governor Arnold Schwarzenegger as Director of his Los Angeles office. She was also appointed to President of the Southern California Leadership Council, founded by four former California Governors and Southern California business and community leaders to address and solve public policy issues critical to the region’s economic vitality. The Junior League of Los Angeles was the first League throughout the Association of Junior Leagues International to dedicate its own independent council strictly for the purposes of advocacy and advancing public policy. Established Appointments to Boards and Commissions Institute (ABCI) which is a training program designed to inform, educate and encourage our members to pursue appointments on California’s many boards and commissions at the local, county and state level and in turn, develop civic leaders within our membership. (2010). 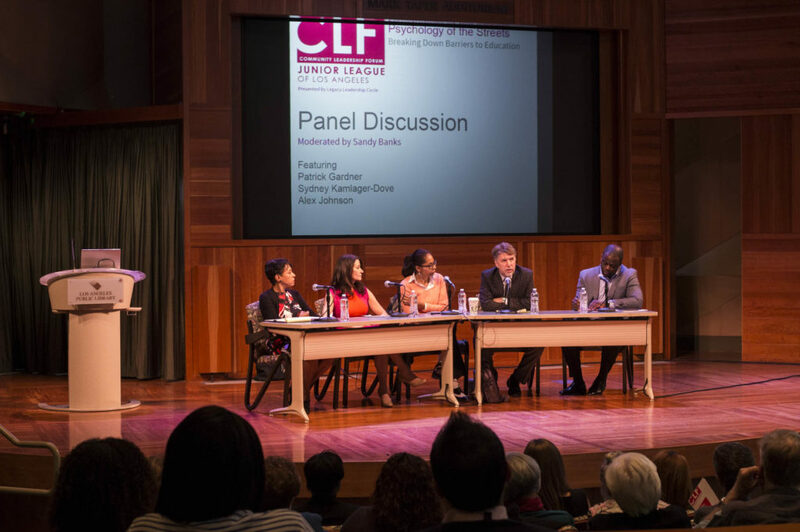 JLLA Participates in Leadership LA!